This blog post about Harry Potter and the Cursed Child is a review, of sorts. I will try my best to avoid spoilers when I can help it so that those of you who intend to read it can still enjoy it spoiler free (from me, at least). But the epilogue of The Deathly Hollows left her fans expecting more. being named after two of the biggest heroes in the history of the wizarding world: Albus Dumbledore and Severus Snape. And right then and there we just know that the story has not ended … but in what medium it will appear, we still didn’t know. JK Rowling did not disappoint her fans. She later announced that, yes, there will be another Harry Potter installment … but it will be a stage play. This news was met with a mixed emotions. Those who resided in the UK and those who can afford to go to the UK had no problem (other than how much the tickets would cost). For the rest of the world, though, we mostly felt sadness and regret and resigned ourselves to the fact that it may take years before we would be able to enjoy The Cursed Child ourselves. And then, sneaky JK, announced in Pottermore that they will be publishing the script of The Cursed Child. Oh, gladness! Yes, I realize she said SCRIPT, not book, but for bookworms like me who grew up reading Shakespearean plays it didn’t really matter. Reading a book for me is like watching a movie in my head. And reading a script actually helps me in blocking my characters in the scenes in my head. 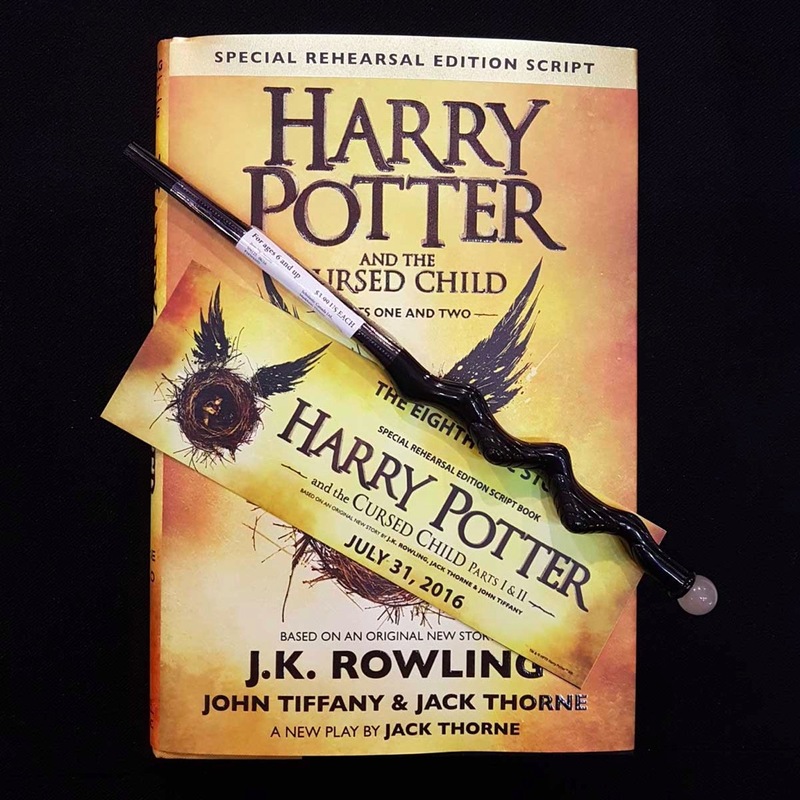 So on July 31, 2016 (Sunday PHT) Harry Potter fans from all over the world prepared to go to their favorite bookstore for the worldwide unboxing of Harry Potter and the Cursed Child … which opens at the same time as the play itself! In the Philippines, Scholastic (the U.S. Publisher) partnered with National Bookstore for local distribution. 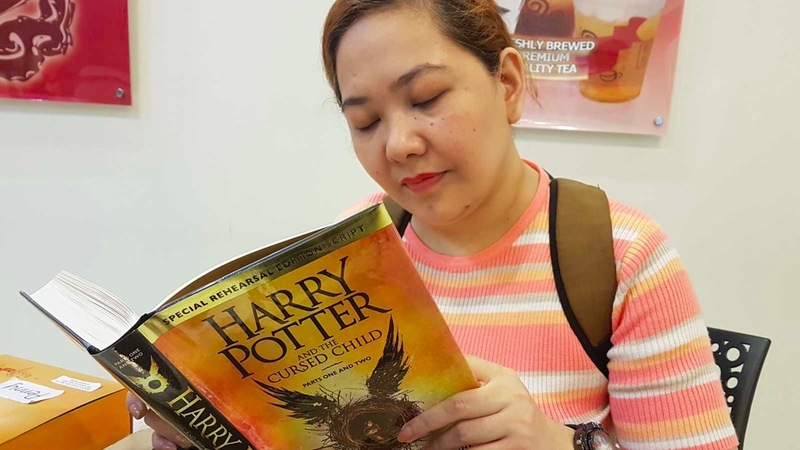 And it was at the Glorietta branch of National Bookstore that Hogwarts Philippines (the official fan club of Harry Potter in the Philippines) invited Potter fans from all over the metro to join in the fun and excitement of being the first to own and read this much-awaited publication. Fully Booked also came out with their copy of Harry Potter and the Cursed Child but, apparently, they are the distributor of the UK Publisher, Little Brown UK. I do not recommend that you do that, by the way. It is difficult to read a play unless you read it all the way through. It’s like stepping out of the theater for a potty break and then coming back a few minutes later and missing your place. Ebony wand pen and bookmark were giveaways at the unboxing event. It is a script of a stage play. Transitions are fast and it lacks the setup narration of regular books but, like I said … it is a stage play. The script of a stage play usually just gives a brief description of the scene, then focuses on the dialogue of the characters plus some direction on what possible action/emotion the character is supposed to portray. This is so that the directors and the cast have leeway to infuse the story with their own special brand. Ok, my first advice to this person would be “catch a play sometime”. I don’t mean to be rude. It’s just that understanding it is a play and knowing the mechanics of a play would make them understand the transitions better. Just as with the original Harry Potter books, the main theme of this story is friendship. And in this story, it centers on the friendship between Albus Severus Potter (Harry’s second child) and Scorpius Malfoy (Draco’s son). 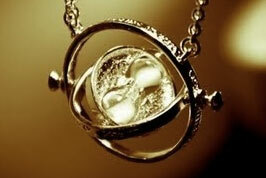 They create a bond from the very beginning … on the Hogwarts Express as they share a compartment on their way to school. Because of his parentage, Scorpius is shunned by his peers as most are under the impression that his real father was Voldemort. Albus, on the other hand, is burdened by his legacy … of being the son of the famous Harry Potter. It also shows us how the friendship between Harry, Ron, and Hermione have grown over the years as they assume their roles as responsible adults and parents. Harry and Hermione work at the Ministry of Magic (only to be expected, don’t you think?) and Ron, well, I don’t want to spoil it so let me just say Ron is doing something else. 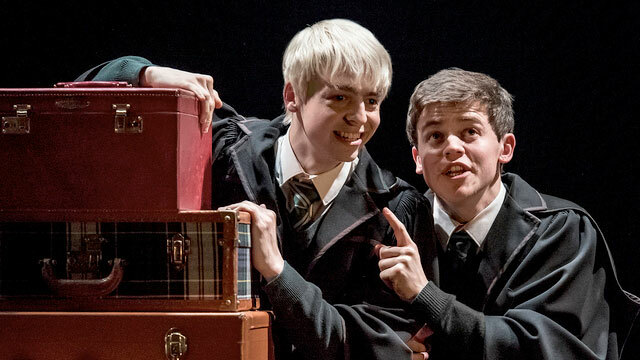 It also tackles the relationship between Harry and Albus. 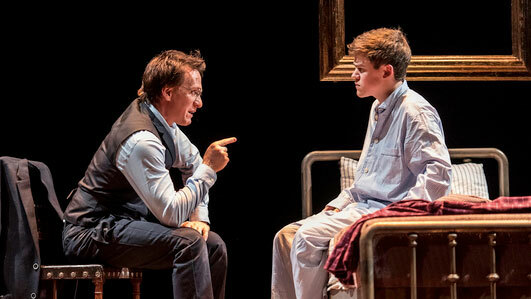 Think of Albus as the rebel — the misunderstood kid that his parents couldn’t understand. Because, in a nutshell, that is what he was. He didn’t fit in at home, he didn’t fit in at Hogwarts. Where his dad, Harry was Mr. Popularity, Albus’ only friend was Scorpius. Perhaps it is because they are so alike that made it difficult for them to understand each other. And just like his dad, Albus wanted to do the right thing and right a wrong that happened many years ago even before he was born. If at first, you don’t succeed, try and try again. And THAT is how the trouble began. As I continue reading, though, I found myself wondering who was really the cursed child? Initially, of course, I assumed it was Albus, because, the title did say Harry Potter and the Cursed Child, which kind of implies it would be his son. But then knowing Scorpius’ story I couldn’t help but think that is it possible that it is actually him? Call me sentimental but my heart soared at the cameos of some of my favorite, much loved, or even drool-worthy characters. I laughed, I cried, I had to pause to wipe my tears. My heart was squeezed in a giant fist and seeing new heroic moments in my head was just phenomenal! Even if they turned this play into a movie, it just won’t be the same without them. I loved it! I had to repeat it from the beginning then read it straight through to the end in five hours straight. I only took short breaks in between to shift position on the bed and to go to the toilet. Would I read it again? Absolutely! But I will wait until the rest of my family have read it, too. 🙂 We are mostly theater enthusiasts so I am confident they will enjoy it as well. I do hope the play comes to Manila, too. How about you? 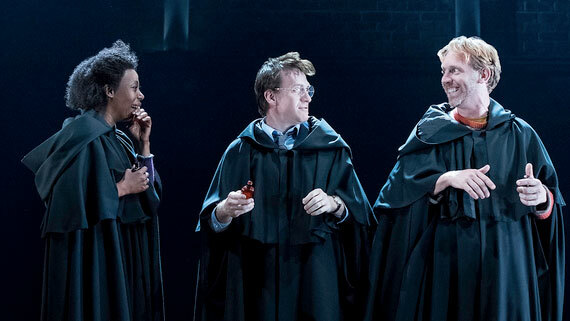 How did you like Harry Potter and the Cursed Child? Share your thoughts below. All photos from the play taken from Rappler.com.